There is now so much outstanding classical music in the Madison area that it is hard to single out one performer or even one group as the Musician of the Year. So this year The Ear was wondering how to honor all the musicians who generally go nameless but perform so well — all those string, brass, wind and percussion players and all those singers –- and not just the higher-profile conductors or soloists. 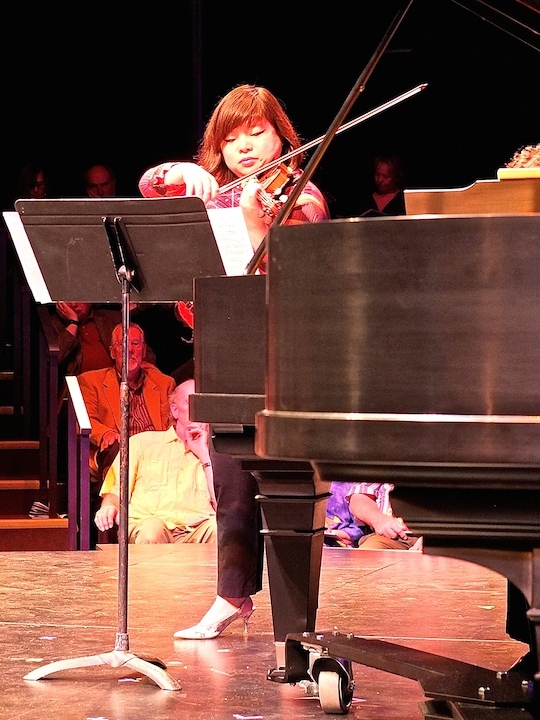 Then he was sitting at the astounding debut recital by Soh-Hyun Park Altino, the new violin professor at the University of Wisconsin-Madison School of Music, given the night of the terrorist attacks in Paris. Her partner was faculty pianist Martha Fischer. And then is when The Ear decided that the Musician of the Year for 2015 should be Martha Fischer (below). I’d say “accompanist,” but we really don’t call them accompanists any more. 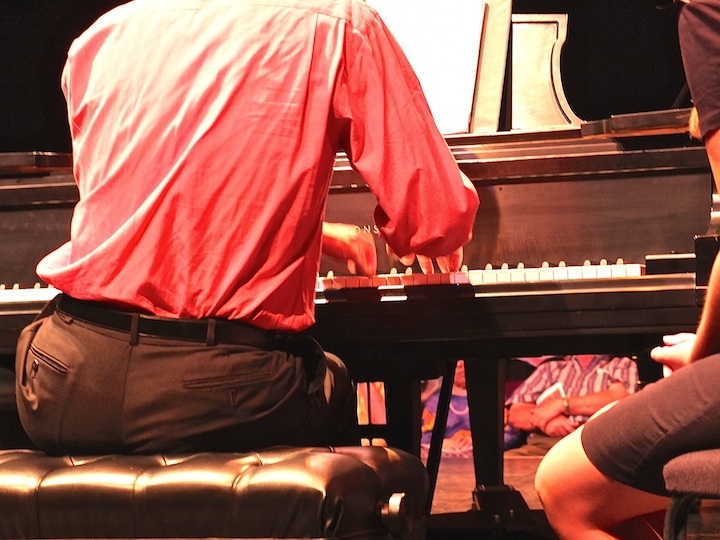 The better term, and the more accurate term, is collaborative pianist. Now, The Ear has to disclose that he knows Martha Fischer and is a friend of hers as well as of her husband Bill Lutes. But none of that takes away from Fischer’s many accomplishments, which too often fly under the radar and go uncredited. Indeed, by honoring her, The Ear also hopes to draw attention to and to honor the many mostly anonymous ensemble and chamber players, including those in the Madison Symphony Orchestra (below top in a photo by Greg Anderson), the Middleton Community Orchestra, the Madison Opera Chorus and the Wisconsin Chamber Orchestra as well as the UW Symphony Orchestra, the Edgewood College orchestras and choirs, the UW Chamber Orchestra and the UW Choral Union (below bottom) and other UW choirs. 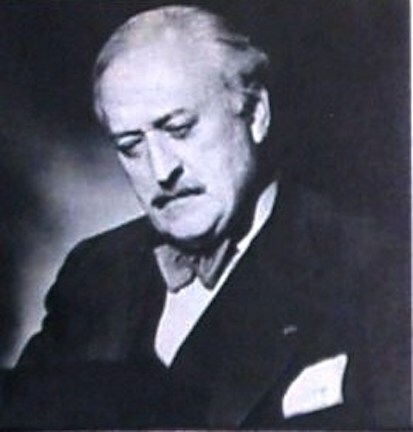 Too often, the members of those groups and so many others — such as the Ancora and Rhapsodie String Quartets, the Oakwood Chamber Players and the Willy Street Chamber Players, the Madison Choral Project, the Festival Choir and the Wisconsin Chamber Choir — pass unnoticed or under-noticed, much like Fischer. But like her, they deserve attention and respect. Because they too are collaborators. They serve the music. The music does not serve them. And the truth is that most music-making is collaborative -– not solo performing. In addition, Fischer is also the model of the kind of academic that Gov. Scott Walker and the go-along Republican Legislators don’t seem to recognize or appreciate. They prefer instead to scapegoat and stigmatize public workers, and to hobble the University of Wisconsin with budget cuts and so-called reforms. Remember that old saying: Those who can, do; those who can’t, teach? It’s nonsense, especially in this case. Martha Fischer is someone who both teaches and performs. She also participates in faculty governance and heads up the committee searching for a new opera director. When The Ear asked her for an update on the search, she provided records with complete transparency up to the limits of the law. Our corrupt, secretive and self-serving state government leaders should be so honest and so open. 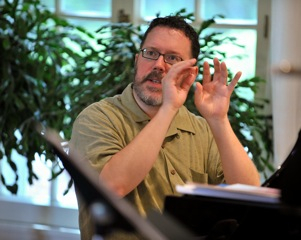 Fischer is a first-rate collaborator who performs and records regularly with other faculty instrumentalists and singers. 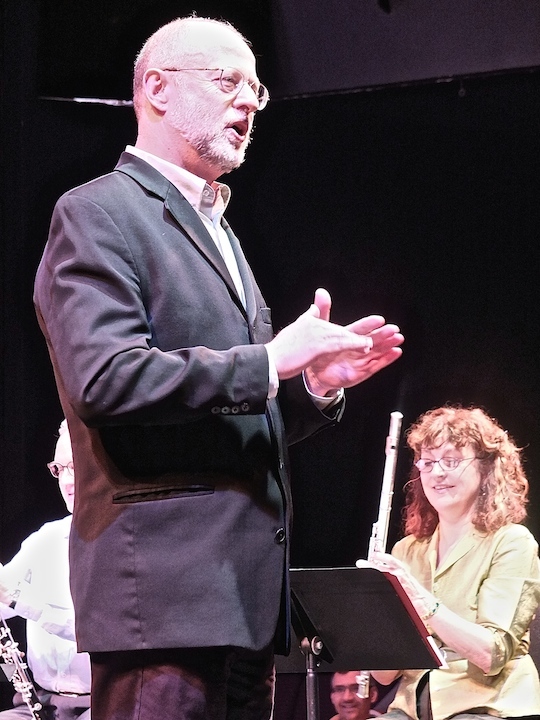 They include UW trombonist Mark Hetzler, trumpeter John Aley and singers baritone Paul Rowe and soprano Julia Faulkner, who has since moved on to the Lyric Opera of Chicago. A model of the Wisconsin Idea in action, Fischer also serves as a juror for piano competitions, gives talks around the state and helps recruit talented students. As a researcher, Fischer – who trained at the Julliard School, Oberlin College and the New England Conservatory of Music — traveled to England and interviewed famous collaborative pianists about playing Schubert’s art songs. By all accounts, Fischer is a phenomenal teacher of both undergraduate and graduate students. 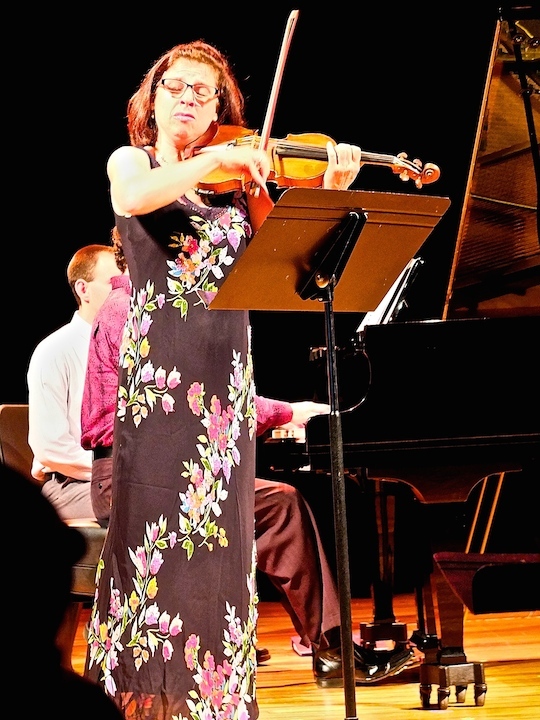 The Ear has heard her students in concerto and solo recital performances, and was impressed. He also talked to her students and heard nothing but praise for her teaching. He has heard Fisher herself sing, from Schubert lieder to Gilbert and Sullivan songs. She does that amazingly well too. 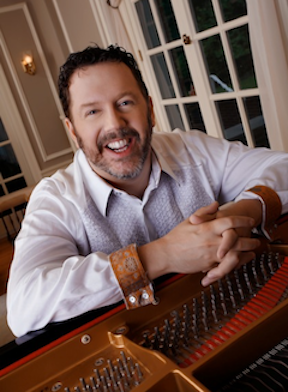 Fisher is one of the co-founders, co-organizers and main performers of the UW’s Schubertiades (below). 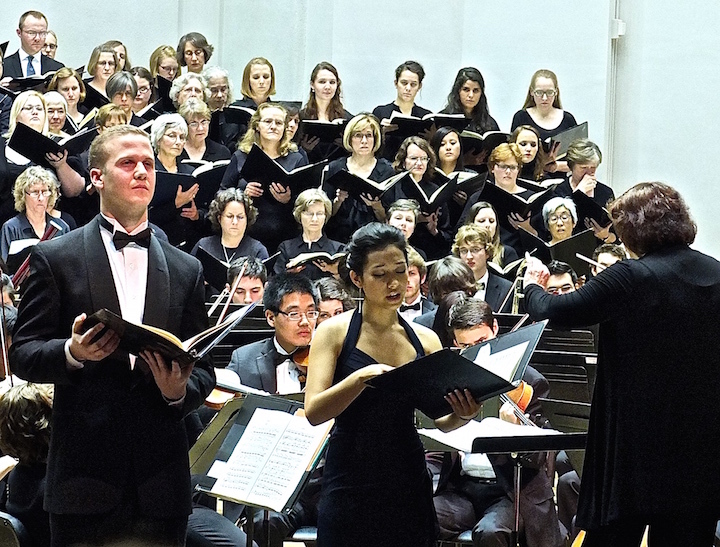 The third annual Schubertiade is on Saturday, January 30, at 8 p.m. in Mills Hall. Go there and you can hear her sing and play piano duets and other chamber music. It is always one of the outstanding concerts of the year. Well, The Ear could go on and on. 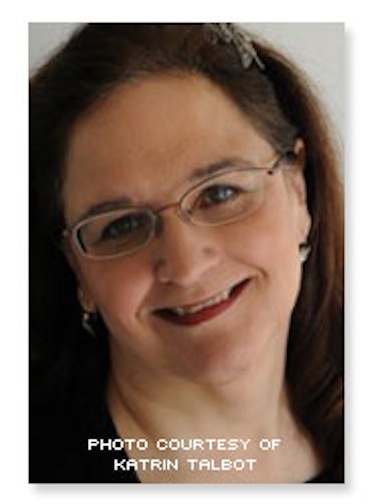 The personable but thoroughly professional Martha Fischer works so hard that there are plenty of reasons to honor her. So, for all the times her playing and other talents have escaped attention, The Ear offers a simple but heartfelt Thank You to the Musician of the Year for 2015. Please feel free to leave your thanks and remarks in the COMMENTS section. Classical music: Arts advocate Valerie Kazamias to receive the second annual John DeMain Award for Outstanding Commitment to Music. 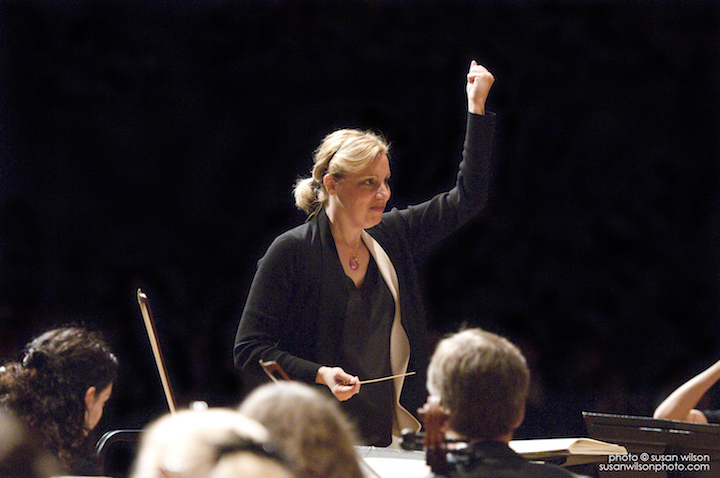 Valerie Kazamias will receive the 2015 John DeMain Award for Outstanding Commitment to Music at the Madison Symphony Orchestra League’s annual Symphony Gala, Sept. 18, 2015, at The Madison Concourse Hotel. 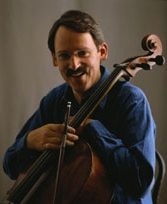 The Madison Symphony Orchestra League (MSOL) is presenting the second annual John DeMain Award for Outstanding Commitment to Music in recognition of an individual or individuals for their longstanding and unwavering support of the League, the Madison Symphony Orchestra (MSO) and music in the community. The award is sponsored by CUNA Mutual Foundation. 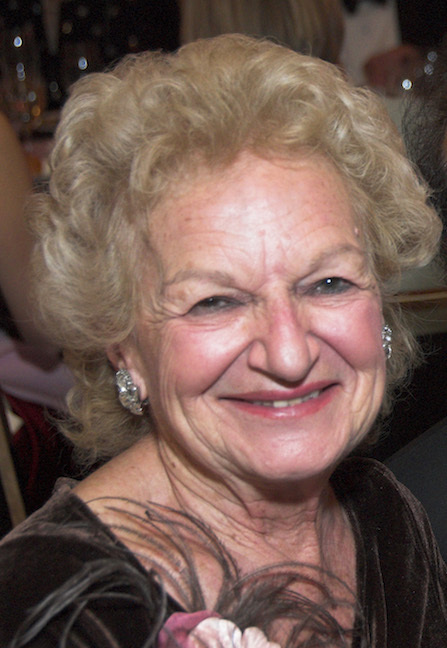 Valerie Kazamias (below) has been a philanthropist and volunteer with the Madison Symphony Orchestra (MSO) since moving to Madison with her family over 50 years ago. 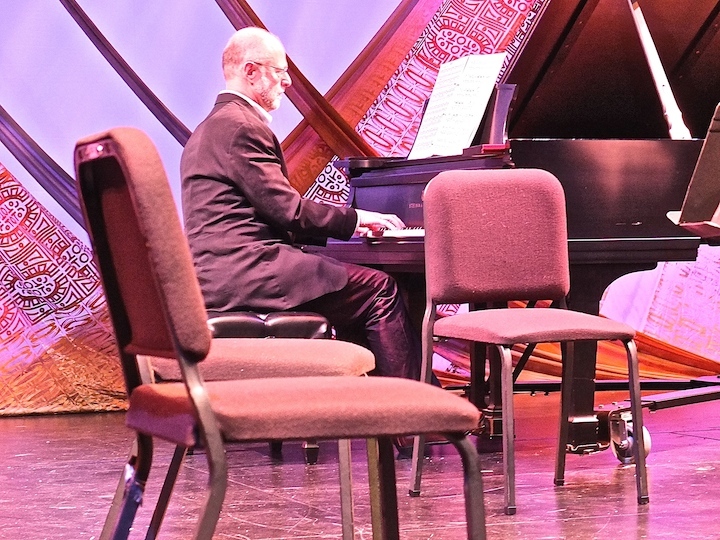 Her tireless efforts and keen fundraising abilities have been instrumental to the success of the MSO, where she has served on the MSO Board and been an active member of the Madison Symphony Orchestra League for over four decades. Kazamias has contributed to the MSO through her involvement with the Development, Marketing, and Nominating Committees. With the MSOL, she has given her time and talent to fundraising committees for a variety of events such as the Symphony Show House, POPS concerts, fashion show and galas. She has been involved with the Arts Ball fundraiser since its inception 45 years ago and has coordinated the event for the past 40 years. The Arts Ball supports both the MSO and Madison Museum of Contemporary Art. It is one of the only dual arts fundraisers in the nation. A Boston native, Kazamias showed her love for the arts as a child when she took piano lessons at the New England Conservatory and art lessons at the Boston Museum of Fine Arts. 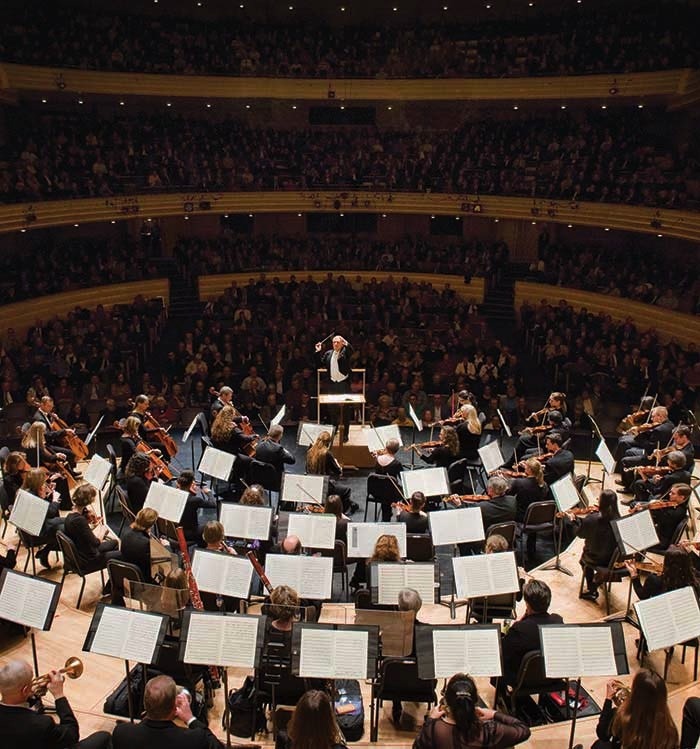 The Madison Symphony Orchestra League presents the Symphony Gala as a benefit and all proceeds support the MSO’s nationally recognized Education and Community Engagement Programs. 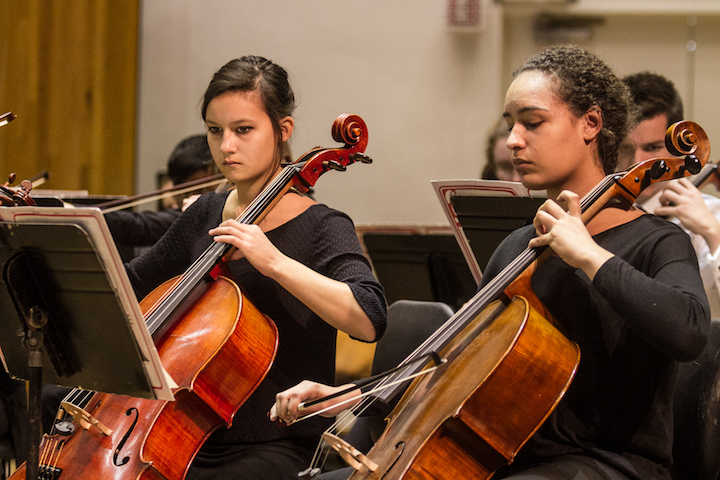 These programs enrich the cultural life of the entire community and help build the future of classical music. 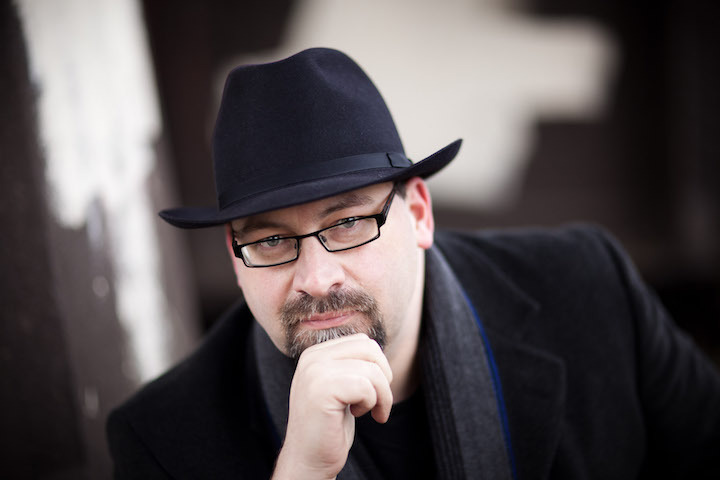 The Madison Symphony Orchestra marks its 90th concert season in 2015-2016 with Music Director John DeMain (below) in his 22nd year leading the orchestra. The MSO engages audiences of all ages and backgrounds in classical music through a full season of concerts with established and emerging soloists of international renown, an organ series that includes free concerts, and widely respected education and community engagement programs. Find more information at www.madisonsymphony.org. Classical music: Door County’s Midsummer’s Music Festival hosts opening night gala is this Friday night. Performers include the Preucil Family plus David Perry and Sally Chisholm of the Pro Arte Quartet at the UW-Madison. 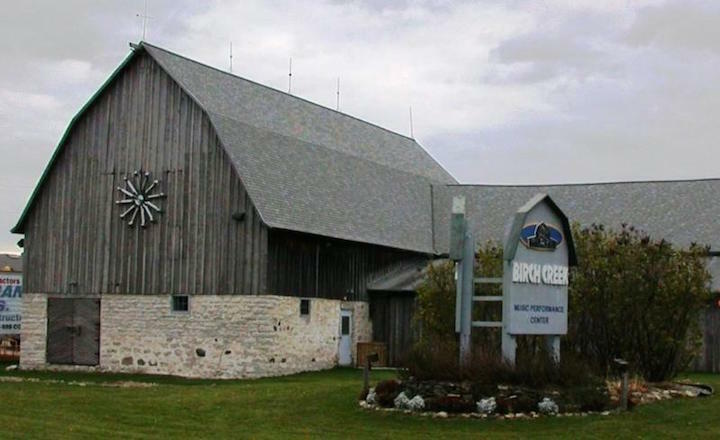 Sister Bay, Wis. – Door County’s Midsummer’s Music Festival kicks off with a gala opening night concert and celebration on this Friday night, June 12, at 7 p.m. in Juniper Hall at the Birch Creek Music Performance Center (below) in Egg Harbor. For this special 25th anniversary season opener, the festival will welcome to the stage the talented Preucil family (below) whose story is deeply entwined in the history of Midsummer’s Music Festival. Twenty-five years ago, festival founders Jim and Jean Berkenstock invited a young couple, along with other top-flight musicians from the Midwest, to join them for the first season of the Midsummer’s Music Festival. Walter Preucil was a cellist with the Lyric Opera of Chicago and his wife Stephanie was an accomplished violinist. Stephanie gave birth to the couple’s first child eight months before the start of the first season. Over the next several years, the couple had two more sons – Anthony and James. And the apple did not fall far from the tree. 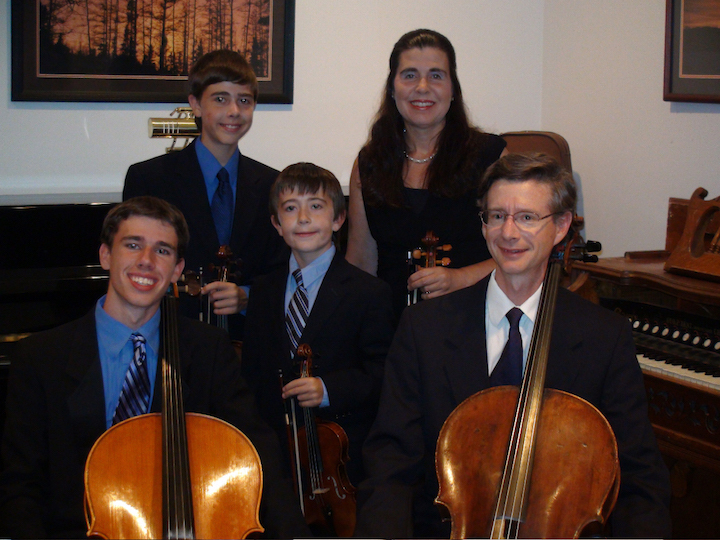 Each of the Preucil boys shared the family’s musical talent. Walter and Stephanie have spent every summer in Door County performing with the Midsummer’s Music Festival, and their boys have become favorites of Door County audiences who have essentially watched them grow up. 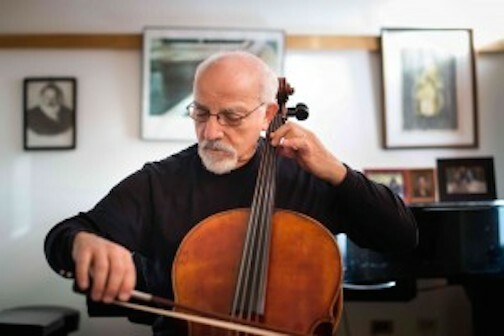 Now Zachary is an accomplished cellist at age 24 and is on the cello faculty of the renowned Music Institute of Chicago. 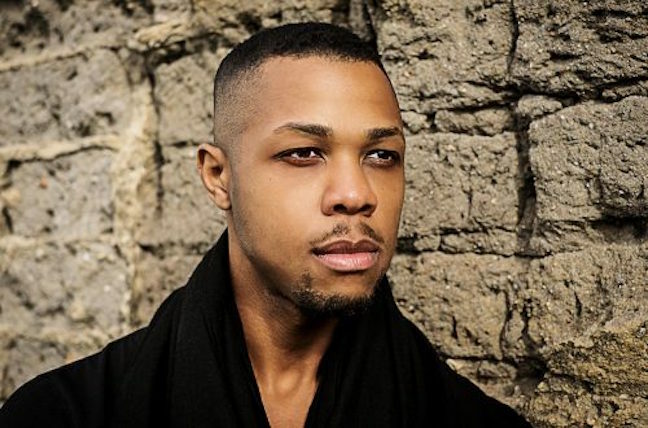 He holds a degree from the New England Conservatory of Music and recently graduated with a masters degree from the Eastman School of Music. Eighteen-year-old Anthony has been concertmaster for the Schaumburg Youth Symphony Orchestra as well as the District 211 Honors Orchestra. Anthony was also Principal Viola for Illinois All-State Honors Orchestra. He will be attending Pennsylvania State University in the fall where he will pursue a double degree in meteorology and violin performance. And 13-year-old James is a skilled violinist who also is the youngest member to have been accepted into the Schaumburg Youth Symphony Orchestra. 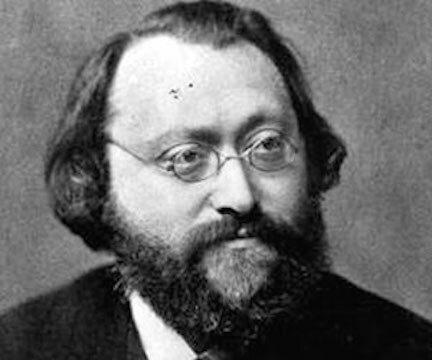 To showcase the story of a very important part of the Midsummer’s Music family, all five Preucils will take the stage and captivate the audience with a performance of the slow “Andante con moto” movement from the String Quintet in E-flat Major by Max Bruch (below). 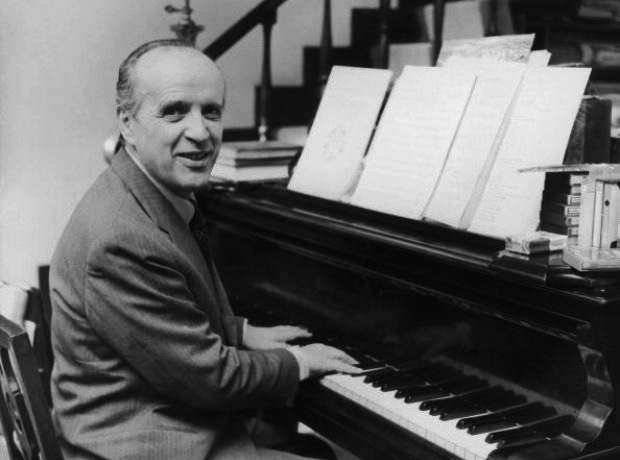 The group will perform the Piano Trio by Nino Rota, famous for his film scores for Italian director Federico Fellini, with Jean Berkenstock, flute; UW-Madison professor and Pro Arte Quartet member David Perry, violin; and William Koehler, piano. Next will be the Quintet in C Minor, Op. 54, by Robert Kahn with Elizandro Garcia-Montoya, clarinet; John Fairfield, horn, David Perry, violin; Walter Preucil, cello; and William Koehler, piano. 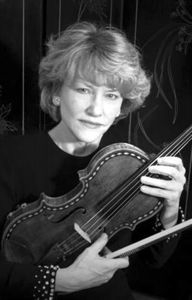 Closing out the program will be the Piano Quartet in E-flat, Opus 47, by Robert Schumann with William Koehler, piano; David Perry, violin (below top); UW-professor and Pro Arte Quartet member Sally Chisholm, viola (below bottom); and Walter Preucil, cello. Following the concert, guests will have the opportunity to mingle with the Preucils, the Berkenstocks and all of the Midsummer’s Music performers at a special reception of wine and hors d’oeurves. A selection of large photos showcasing the Midsummer’s Music Festival’s family over the 25 years will be on display. During the reception portion of the evening, Midsummer’s Music will unveil a brand new artwork designed by Door County artist Charles “Chick” Peterson to celebrate the festival’s 25th anniversary season. 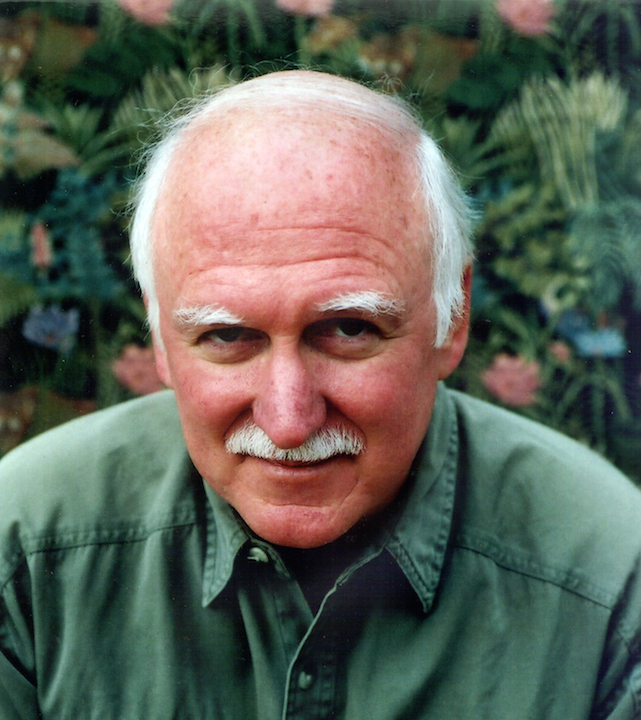 Peterson is best known for his watercolor paintings and has established a world-class reputation for his maritime works. Many of his pieces depict fond memories of everyday life. The painting will capture the collegial spirit of the Midsummer’s Music ensemble. Patrons can purchase matted copies of the limited edition print beginning June 12 and continuing through the Big Top Door County event on July 12. Proceeds will support the Midsummer’s Music mission of bringing exceptional classical music to Door County audiences at affordable prices. Midsummer’s Music Festival features world-class musicians from organizations such as the Lyric Opera of Chicago, Pro Arte Quartet (below, in a photo by Rick Langer), Aspen Music Festival, the Chicago Philharmonic Orchestra and artist faculty from major universities. 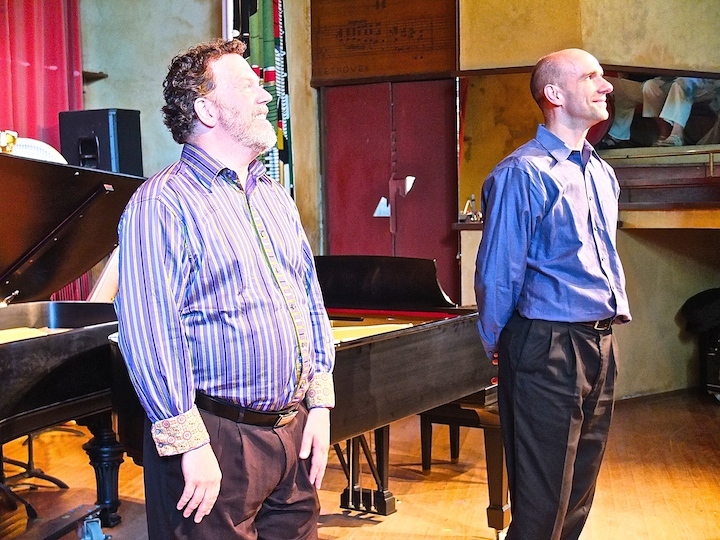 The festival presents a series of more than 30 classical music concerts in a host of unique venues ranging from a 120-year old bay side warehouse, to a quaint community church from the 1850s, to luxury homes of private residents. Each venue exudes character and offers a distinct musical experience for the listener. 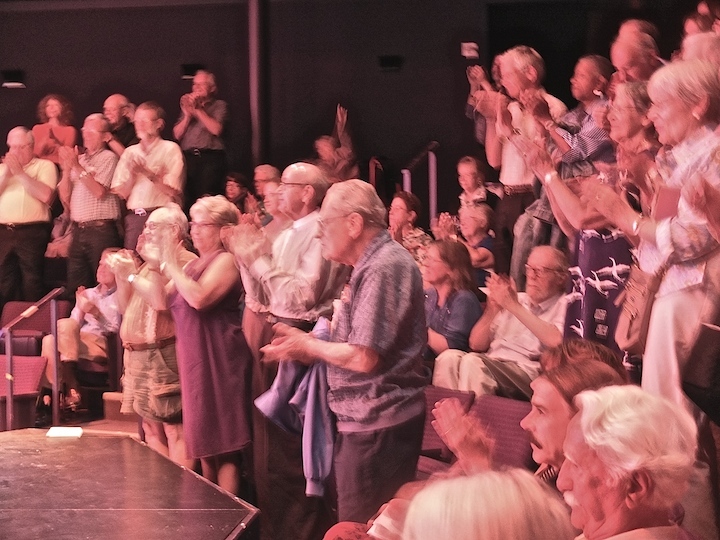 This year’s festival runs June 12 through July 14, with an additional concert series of 10 performances during the week and a half leading up to Labor Day. Tickets for the opening night gala are $60. For more information on the opening night gala or any of the Midsummer’s Music concerts, visit www.midsummersmusic.com or call 920-854-7088. The Birch Creek Performance Center is located at 3821 County Road E, Egg Harbor, WI 54209. 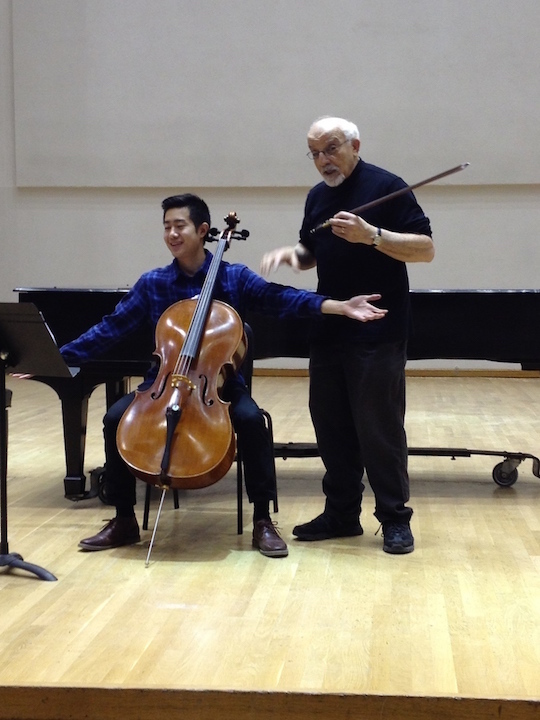 Classical music: The sixth National Summer Cello Institute and “Feldenkrais for Performers” will take place over the next two weeks at the UW-Madison School of Music. 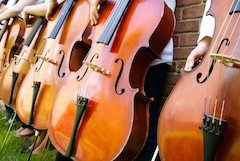 The event culminates in a FREE cello choir concert on June 12. 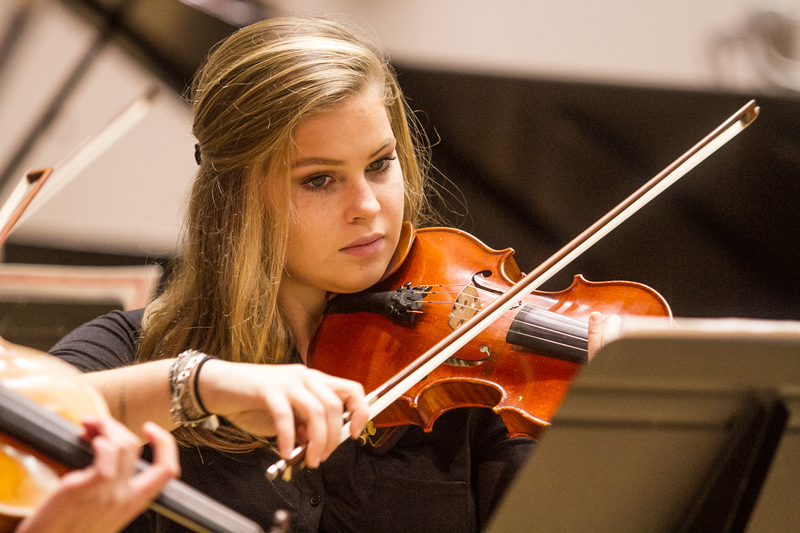 Following the success of five previous seasons, the Your Body is Your Strad summer programs are open for auditors and concert-goers in 2015. This includes events during the Feldenkrais for All Performers program (May 30-June 3) and the National Summer Cello Institute (May 30-June 12). The programs focus on the connection between body awareness and technical proficiency, artistic expression, effective teaching and injury prevention. The workshops feature husband-and-wife musicians and Feldenkrais practitioners Uri Vardi and Hagit Vardi (below with a student), with other faculty including Paul Katz of the New England Conservatory and Tim Eddy of the Juilliard School and Mannes Conservatory. There will also be featured presentations by specialists in Integrative Health, Authentic Performance, Mind-Eye Connection, Stage Anxiety and Improvisation. All events will take place at the Humanities Building at 455 N. Park St. in Madison, Wisconsin unless noted otherwise. 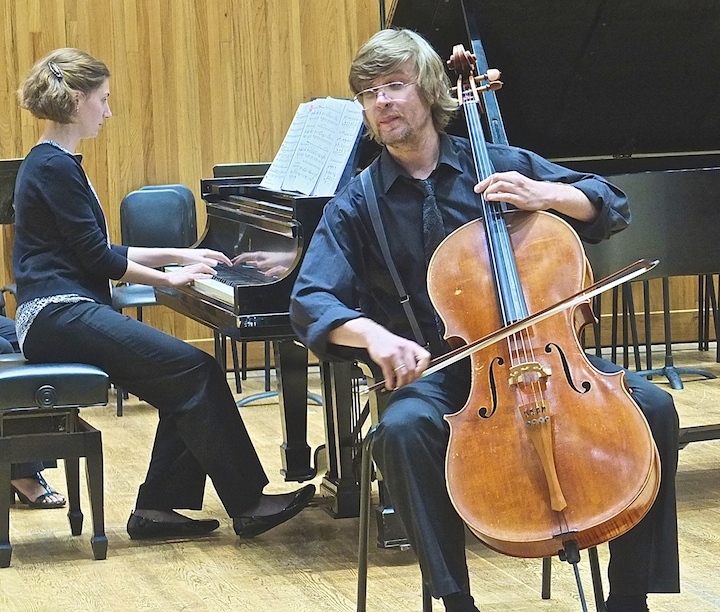 Friday, June 12 at 8 PM in Mills Hall (FREE): “Final Concert” — the culminating concert of the National Summer Cello Institute, featuring solo performances of the Institute’s talented participants and the NSCI Cello Choir led by Kyle Knox (below). 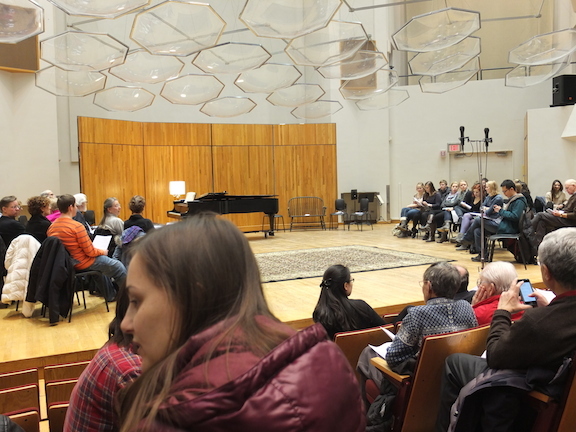 The program for the final concert is partially set: the first half will be solo performances by participants of the National Summer Cello Institute, and the after intermission will be pieces for the NSCI Cello Choir. 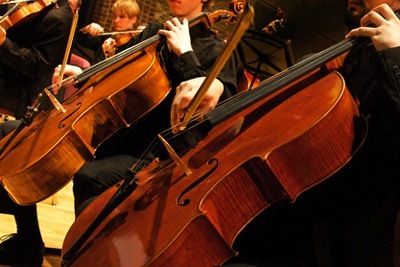 The solos will be decided through audition next week, but the rep for the Cello Choir is decided. *Kyle Price is the student composer and a Collins Fellow at the UW-Madison School of Music, studying cello as a Masters student with Uri Vardi. He is also an avid composer, and runs a music festival in upstate New York called Caroga Lake. The Requiem to be performed was written in memory of his aunt, a cellist who had attended NSCI in previous summers. 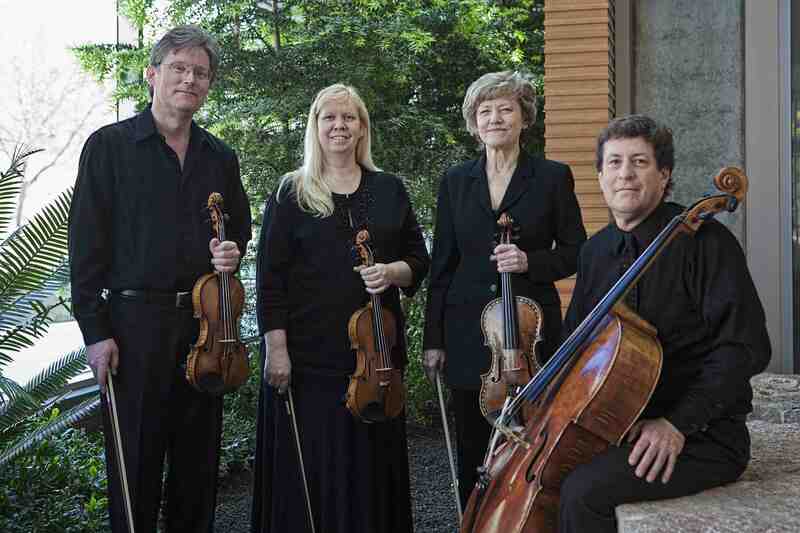 Classical music: The Ancora String Quartet closes its 14th season this Friday and Saturday nights in Janesville and Madison with works by Beethoven, Brahms and Shostakovich. 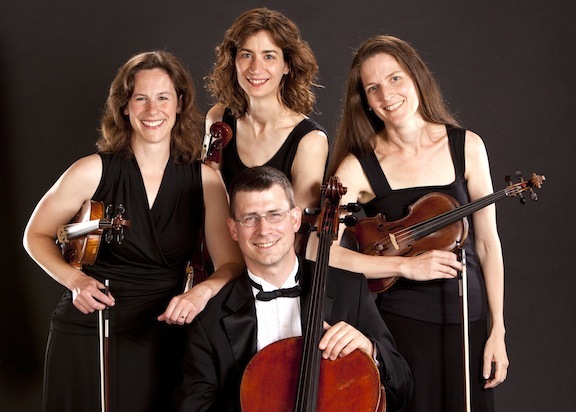 The critically acclaimed Madison-based Ancora String Quartet (below) will present two concerts this weekend to close its 14th season. A FREE performance this Friday night, May 22 at 7:30 p.m., at the Janesville Woman’s Club Association. Donations will be gratefully accepted. 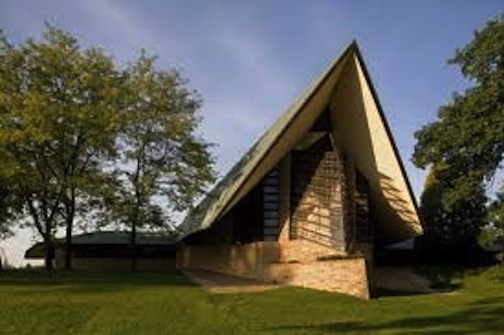 A ticketed performance on Saturday night, May 23 at 7:30 p.m., in the Landmark Auditorium in the meeting house of the First Unitarian Society of Madison (below), designed by Frank Lloyd Wright, at 900 University Bay Drive, in Madison. Tickets are general seating and available at the door. They cost $15 for the general public, $12 for seniors and students, $6 for children under 12. The Quartet No. 1 in C major, Op. 49, by Dmitri Shostakovich, which presents the composer’s trademark quirkiness in fresh, innocent and fantastical form. The String Quartet No. 11, Op. 95, “Serioso” Ludwig van Beethoven, where the terse energy is lightened by a melting, lilting Allegretto. 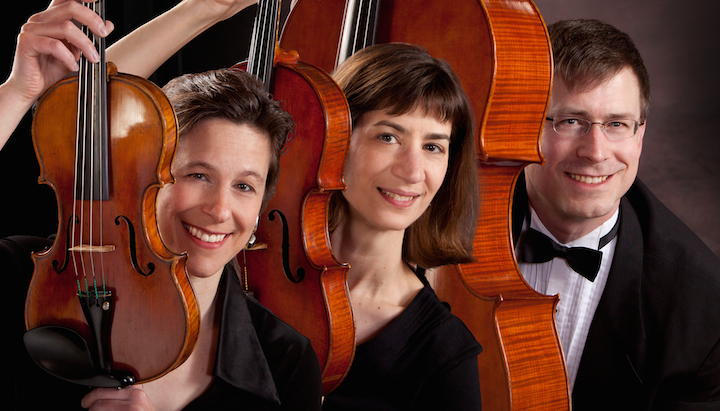 Current members of the Ancora (below, in a photo by Barry Lewis) are cellist Benjamin Whitcomb, who teaches at the UW-Whitewater; violinist Robin Ryan, left) and violist Marika Fischer Hoyt, who also plays with the Madison Bach Musicians and Madison Symphony Orchestra, and is a weekend host for Wisconsin Public Radio. With first violinist Leanne League on leave until next fall, we are excited to work this spring with guest violinist Eleanor Bartsch (below), a University of Wisconsin-Madison School of Music graduate and a musician of superb musicality with an impressive resume and a devoted local following. 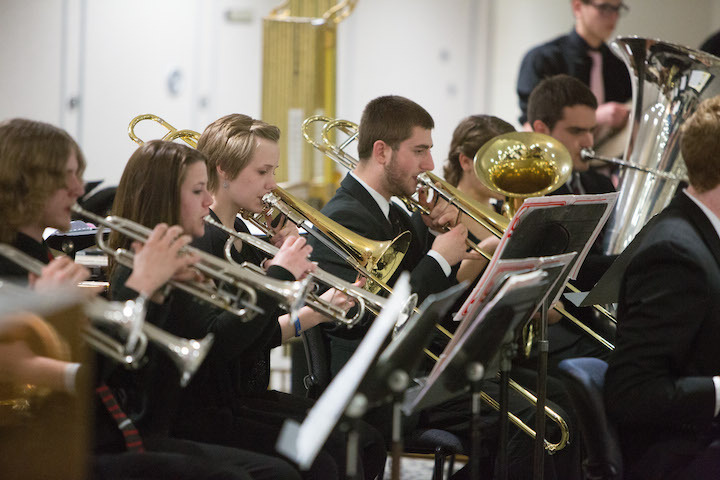 The members’ credentials include degrees from the Indiana University School of Music and the University of Texas-Austin, as well as study at the New England Conservatory and Eastman School of Music. 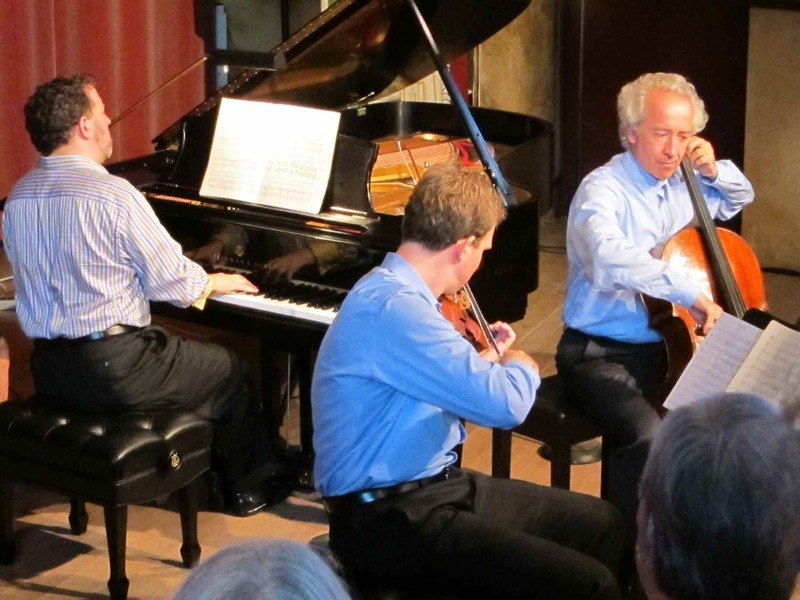 Individually, they have attended numerous chamber music festivals and performed across the United States and Europe. The four players have well-established individual musical careers as soloists, chamber musicians and orchestral players. They perform constantly in Madison and beyond, appearing regularly in such ensembles as the Madison Symphony Orchestra, the Wisconsin Chamber Orchestra, the Madison Bach Musicians, the Wisconsin Baroque Ensemble, and the Bach Collegium of Fort Wayne, Indiana. Classical music: Is there more to say about Beethoven and his music? Acclaimed musicologist Jan Swafford thinks so, and says so in his new biography of The Ludwig. 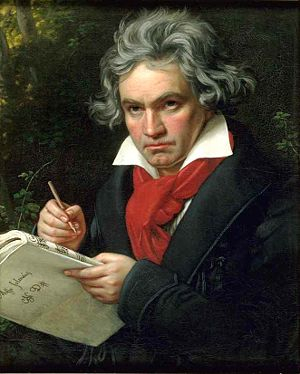 By most polls and surveys, the most popular composer of classical music remains Ludwig van Beethoven (below). The surly, willful and influential musician bridged the Classical and Romantic eras, and his music retains much of its power and universal appeal even today. The “Emperor” Concerto for piano. The “Razumovsky” and “Late” String Quartets. 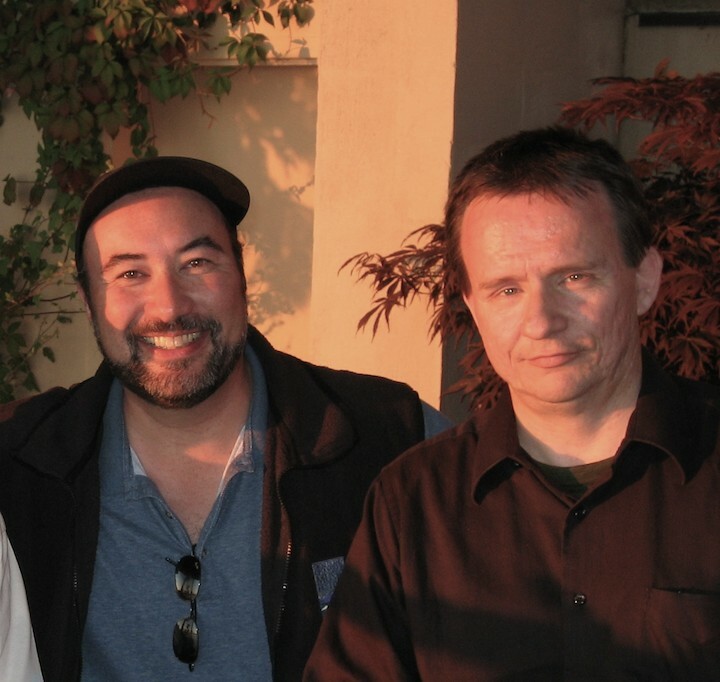 The “Ghost” and “Archduke” piano trios, and the “Triple” Concerto. The “Moonlight,” “Pathetique,” “Tempest,” “Appassionata,” “Waldstein” and “Hammerklavier” piano sonatas. 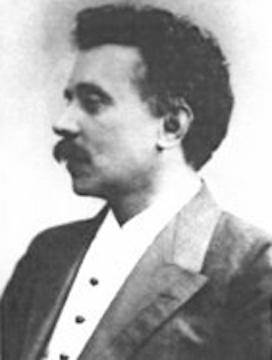 The “Spring” and “Kreutzer” violin sonatas. Such nicknames and so many! Talk about iconic works! What more is there to be said about Beethoven? Well, quite a lot, apparently, according to the acclaimed music historian Jan Swafford (below), who did his undergraduate work at Harvard University and his graduate work at Yale University and who now teaches composition and music history at the New England Conservatory of Music. It is getting some mixed or qualified reviews. But before you look into that, better check into the pieces that NPR (National Public Radio) did on Swafford and his takes on Beethoven, some of which defy received wisdom and common sense. Here is a summary of some common perceptions about Beethoven that may -– or may NOT –- be true, according to Swafford. It i s an easy and informative read. Some critics have questioned whether the book (below) is too long, whether it repeats things that are already well known and whether the writing style is accessible to the general public. But nobody is ignoring it. Here are two reviews by reputable media outlets. Have you read Jan Swafford’s other work? What do you think of his music histories and biographies? 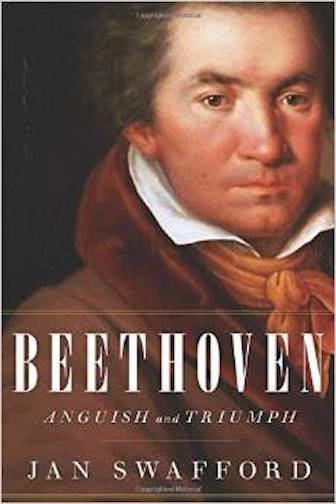 Or of his new Beethoven book, if you have read it? And what is your favorite work by Beethoven? Classical Music: At Bach Dancing and Dynamite Society concerts, The Ear always learns as he listens. Here are some lessons from last weekend that will no doubt reappear this coming weekend. This summer, The Ear has yet to see a missed opportunity or hear a false note from the Bach Dancing and Dynamite Society, which seems headed for a perfect season. I find that each of the two weekend programs that the BDDS offers in three venues for three weekends each summer usually rewards me with a generous share of pleasure plus important lessons and pleasant surprises. Little wonder, then, that the BDDS has had its best second weekend ever last Friday, Saturday and Sunday, according to BDDS executive director Samantha Crownover. Last weekend certainly did offer much pleasure, plus many lessons and surprises, with the “Take a Hike” and “Hasta la Vista, Baby” programs. And there is no reason to think that this coming weekend’s two programs — “Cut and Run” and “Hightail It” — won’t do the same. So here are some quick looks backward that are likely to serve as good looks forward. An avid amateur pianist myself, I get to hear terrific pianists whom I can emulate and who inspire me to practice and play better. 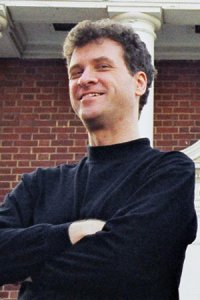 Almost every concert features BDDS co-founder and co-artistic director Jeffrey Sykes, who teaches at University of California-Berkeley and California State University-East Bay. Sykes never disappoints. He is a master of different styles, color and dynamics — in short, an ideal collaborator. 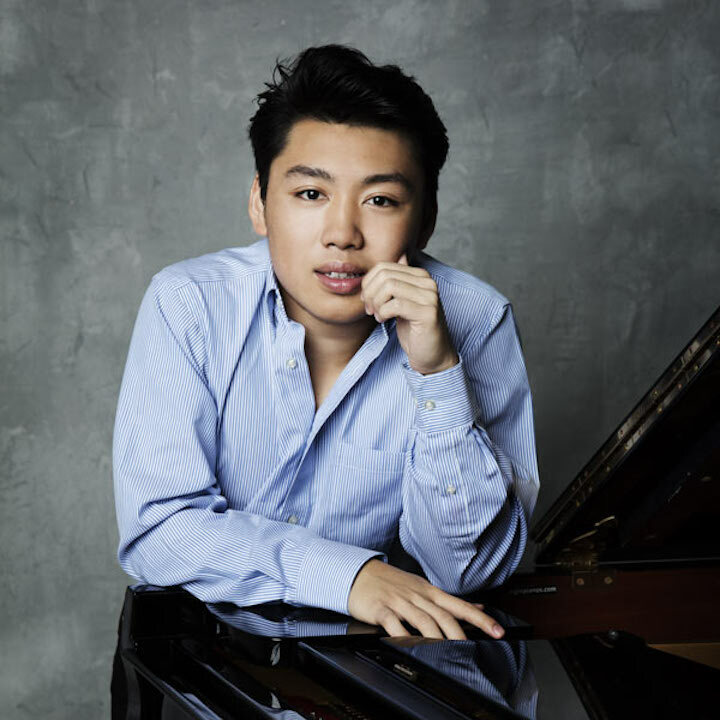 And last weekend, this Pianist for All Seasons demonstrated yet another skill with his improvised embellishments and ornamentation on themes and passage work in a well-known Mozart piano concerto (Piano Concerto No. 23 in A Major, K. 488). This weekend Sykes will play by himself in piano trios by Dmitri Shostakovich and Antonin Dvorak with the San Francisco Piano Trio of which he is a member. 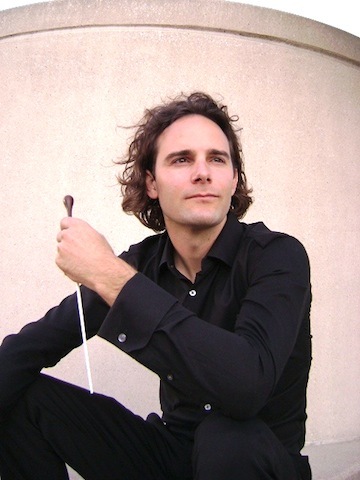 He will also perform duets and trios with his BDDS co-founder and co-artistic director flutist Stephanie Jutt. 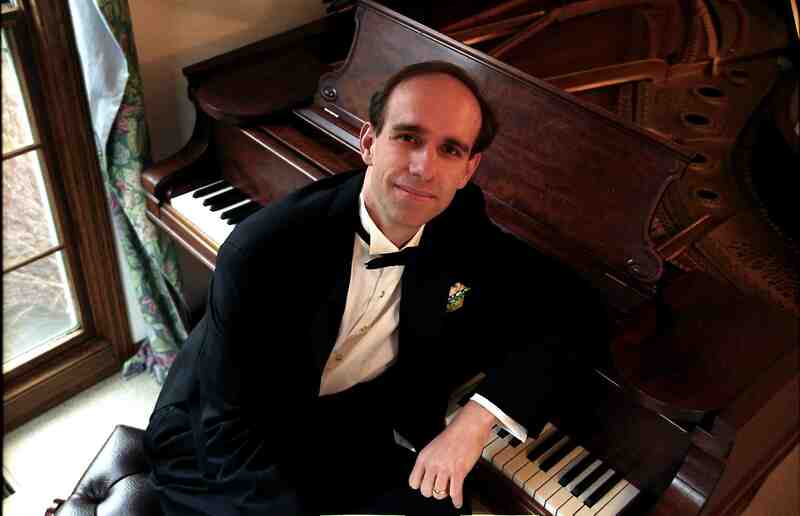 Particularly noteworthy is that this weekend, Sykes will again be joined by fellow pianist Randall Hodgkinson (below) in works for one piano, four hands, one by Darius Milhaud with a Charlie Chaplin movie to accompany it. Hodgkinson teaches at the New England Conservatory of Music and Wellesley College, and he is really good. 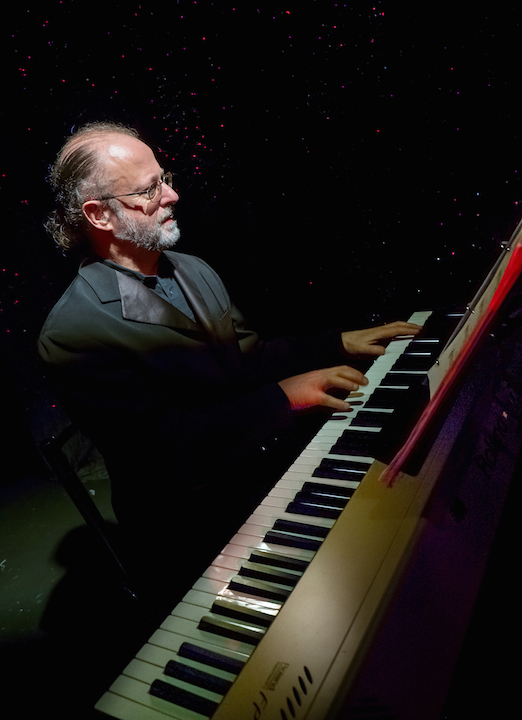 Still, the real piano treat last weekend was tango pianist – and also music arranger -– Pablo Zinger (below), a native Uruguayan who now lives in New York City. Zinger once arranged music for and performed the works of Argentinean tango master Astor Piazzolla. And it was in two evenings of Piazzolla’s tangos that Zinger displayed his amazing skills. I watched how carefully he pedaled, never overdoing it. I listened to how well he balanced volume with other instruments. I heard his unfailing ability to execute complex rhythms and to quickly but naturally change tempi. I listened to what seemed an undeniably classical keyboard technique that allowed him to play multiple voices independently, as in a Bach fugue. Articulate and laconic, Pablo Zinger (below top, he is talking; below bottom, he is playing) proved nothing short of a master instrumentalist, not just some generic dance-band pianist. I don’t think I will ever forget his rendition with BDDS of Astor Piazzolla’s heartbreakingly beautiful “Oblivion,” which you can hear in a comparable chamber music arrangement in a YouTube video at the bottom. I get to hear first-rate, terrific artists from out-of town. 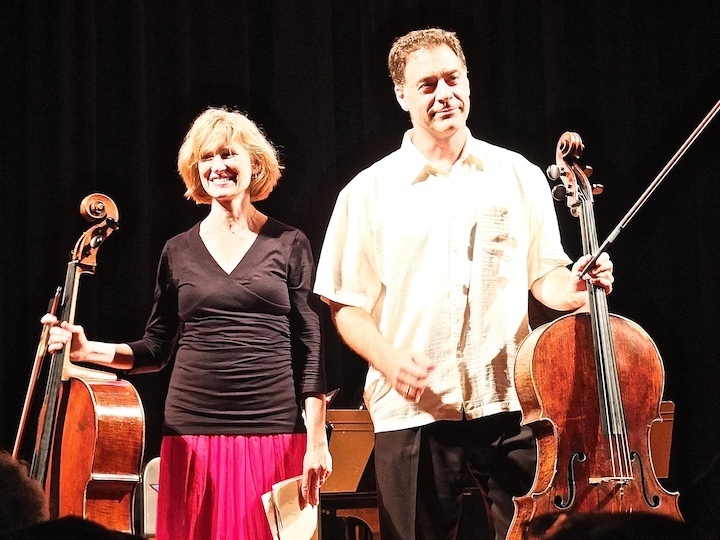 Some of the performers who were familiar from past BDDS seasons included husband-and-wife cellists Anthony Ross and Beth Rapier, who both play with the Minnesota Orchestra. They are terrific separately and together, as when they played the only Concerto for Two Cellos composed by Antonio Vivaldi (below) whose appealing works we hear played live too infrequently. The Beach Romance also reminded me of what a great strategy it is to open a concert with a slow piece to help get the audience into The Zone. In a way, it seems like back to the future, back to Baroque-era sonatas that went Slow-Fast-Slow-Fast rather than the Classical-era style of Fast-Slow-Fast in their sequence of movements. More concert programs should do the same. 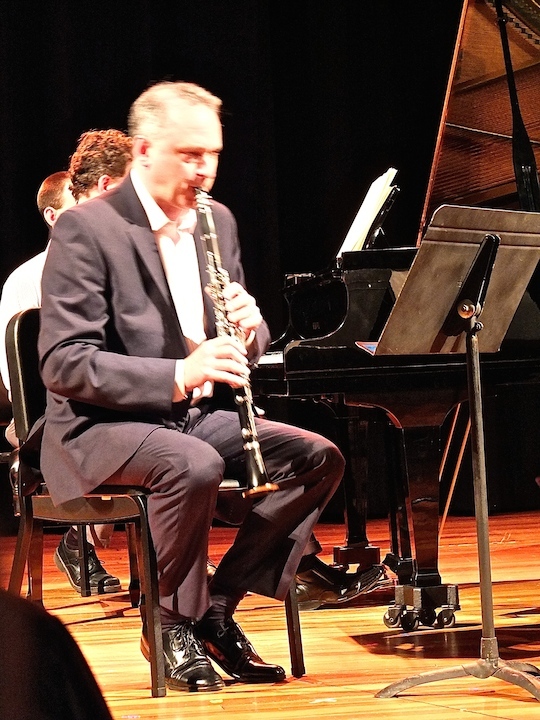 Clarinetist Alan Kay, who performs in New York City and who teaches at both the Mannes School of Music and the Juilliard School of Music in New York City, proved simply sublime in the great “autumnal” Clarinet Trio by Johannes Brahms as well as other pieces. What tone, color and control the man has. He made klezmer-like passages both howl with laughter and lament with moans. I get to hear unknown or neglected repertoire, both old and new. Last weekend, as I said earlier, one gem was the Romance for Violin and Piano by Amy Beach; another was the chamber music arrangement by Johann Nepomuk Hummel of a Mozart piano concerto. I also liked a pampas- or gaucho-inspired work by Alberto Ginastera for cello and piano. Contemporary composer Osvaldo Golijov’s string quartet and clarinet called “The Dreams and Prayers of Isaac the Blind” (1994) was breathtaking. This weekend I will get to hear music by composers I have never even heard of: Philippe Gaubert (below top), who, I suspect, sounds a bit like Gabriel Faure, and will feature virtuoso flutist Stephanie Jutt, BDDS co-founder and co-artistic director ; plus another Argentinean composer Angel Lasala (below bottom) and William Hirtz (below bottom right with pianist Jon-Kimura Parker on the left), who are also complete unknowns to me. That adds excitement. I learned that the importance of dance forms in music survives. In Baroque suites like the French and English Suites of Johann Sebastian Bach, the Concerti Grossi of George Frideric Handel and of various Italian composers, you find the allemande, gigue, minuet and sarabande among other dance forms. In the Romantic era, it was the waltz, the polonaise, the mazurka, the polka and the Slavonic Dances of Antonin Dvorak and Hungarian Dances of Brahms. I could go on, but, you get the idea. I find the Bach Dancing and Dynamite programs extremely well planned and then extremely well executed. 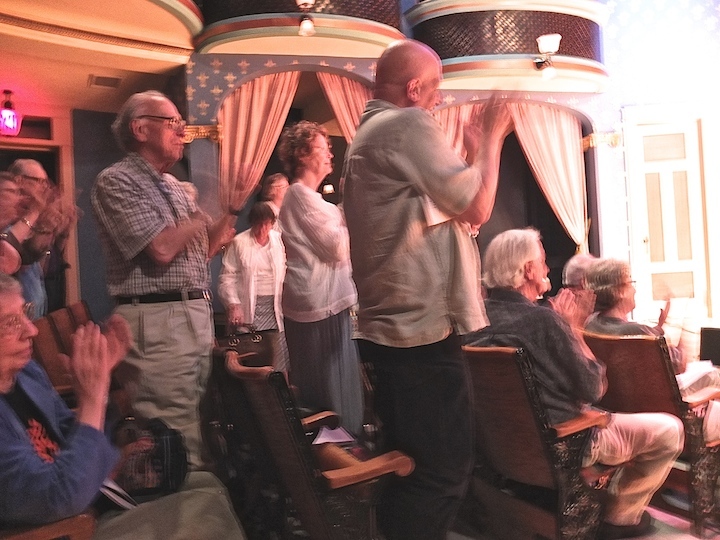 And I am not alone, as repeated standing ovations demonstrate (below left at the Stoughton Opera House, below right at The Playhouse in the Overture Center). To miss music and performances as fine as these is to cheat yourself. And that just doesn’t make sense, does it? Classical music: The Ear gets totally immersed in two-piano music by the Bach Dancing and Dynamite Society, and loves it. Now he looks forward to “drowning” this weekend in European concertos and South American tangos, then piano trios and works for piano, four-hands. The Ear thinks of it as the Berlitz Method of learning a language, only applied to music. But one thing I especially look forward to is that usually there is a chance to immerse yourself in a special style or genre or sub-category that you often don’t hear. That allows for added enjoyment and informative comparisons. This summer’s immersion started this past opening weekend. This coming weekend and the weekend after that promise an immersion in Western European classics, especially concertos, and in Latin American music, especially Argentinian tangos. Some of that kind of immersion stems from the BDDS programming philosophy. Some of it probably also comes from the fact that BDDS hires guest artists for a weeklong stint and so must seek out repertoire to spotlight them. In any case, this is the summer not only of Latin American music but also of two-piano works. This is not to say I didn’t love the outstanding performance of Claude Debussy’s sublime Violin Sonata, his last work, by New York violinist Yura Lee (below) because I did. 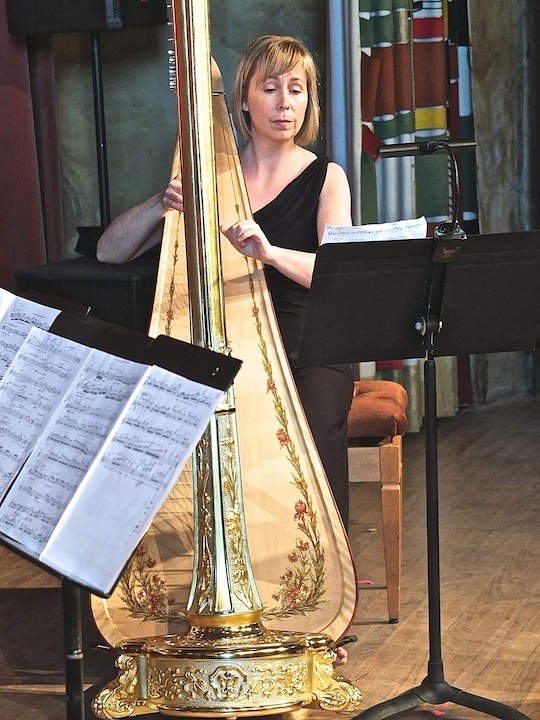 And I also liked the BDDS debut of Icelandic soprano Disilla Larusdottir (below) in her superb readings of “Five Popular Greek Melodies” by Maurice Ravel and especially contemporary American composer Aaron Jay Kernis’ Renaissance-based “L’arte della danssar” (“The Art of the Dance,” 2011). 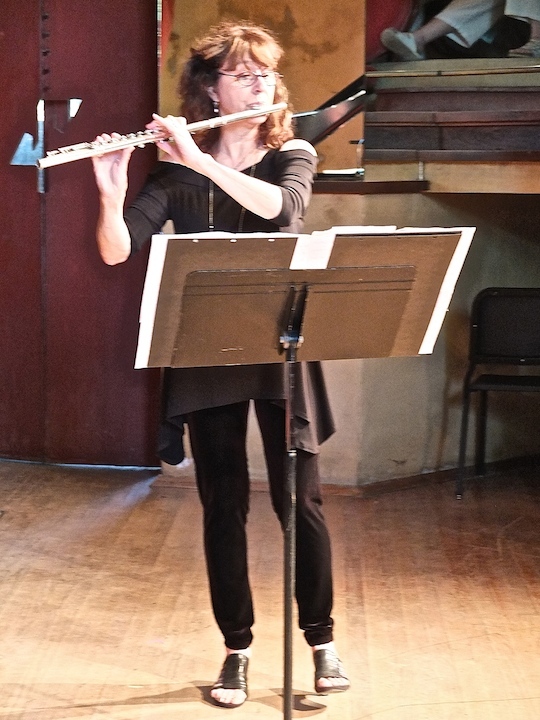 I also thoroughly enjoyed the vivacious and captivating Introduction and Allegro for Flute and Piano by Carlos Guastavino with BDDS co-founder and co-artistic director Stephanie Jutt (below), who is also principal flute of the Madison Symphony Orchestra. 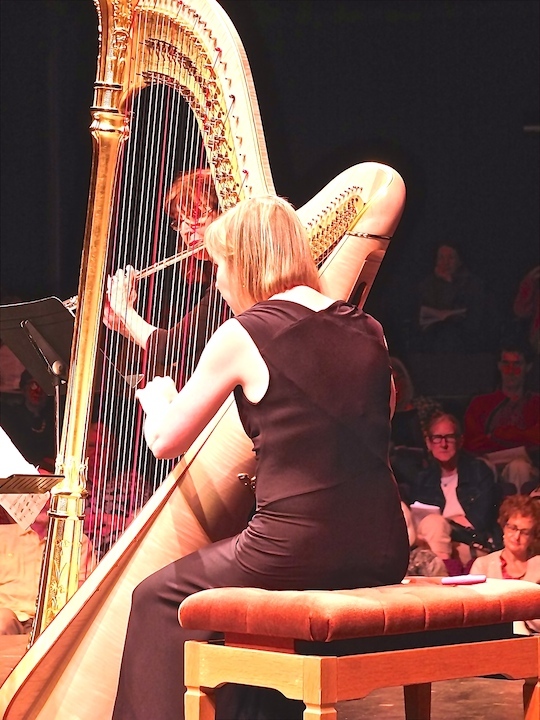 Personally, The Ear is generally less enthusiastic about harp music, so the Celtic-themed sonata by Arnold Bax left him feeling half-hungry, despite a terrific performance (below) by Stephanie Jutt and the gifted guest harpist Heidi Krutzen. Even the Quartet by Carl Philipp Emanuel Bach struck me as not especially inspired, but rather a pretty run-of-the-mill Classical work that, despite a fine performance, has charms but not genius. To The Ear, the true stand-outs stand-outs of the first weekend were Jeffrey Sykes, the pianist who co-founded and co-directs the BDDS with Jutt and who teaches at the University of California-Berkley; and guest piano virtuoso and Van Cliburn Competition prizewinner Christopher Taylor of the University of Wisconsin-Madison School of Music, who has a national and international reputation. 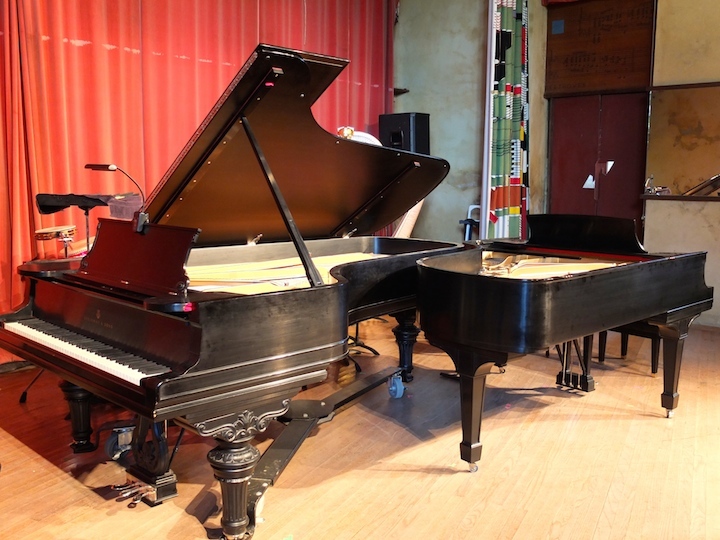 And The Ear, himself a devoted amateur pianist, sure got an earful of great, first-class piano playing through four very difficult works for two pianos. Such concerts are not easy to stage. To get two pianos on stage at The Playhouse in the Overture Center and the Hillside Theater famous architect Frank Lloyd Wright’s Taliesin compound in Spring Green involves a lot of difficult and expensive logistics. But it was done, and the results were terrific. As almost always happens with BDDS, there were pleasant surprises. On the other hand, it was something to see the insistent rhythms make the always physical and impressively dynamic Christopher Taylor (below) rock out and to watch how a single repetitive note gradually worked up to five-finger chords. There was 20th-century Polish composer Witold Lutoslawski’s biting and percussive Variations on the famous theme by Niccolo Paganini that was also used by Franz Liszt, Johannes Brahms and Sergei Rachmaninoff. There was Ravel’s “La Valse,” a grandly elegant and overblown nostalgia trip to the society embodied by the waltz as it came to its chaotic end in World War I. Now the two-piano part of the BDDS season is over. But The Ear can’t wait for this coming weekend, which will bring a Concerto for Two Cellos by Antonio Vivaldi as well as the lovely Piano Concerto No. 23 in A Major, K. 488, by Wolfgang Amadeus Mozart plus the great Clarinet Trio by Johannes Brahms and selected tangos by Astor Piazzolla with tango pianist Pablo Zinger (below), who performed with Piazzolla’s band, from Argentina. 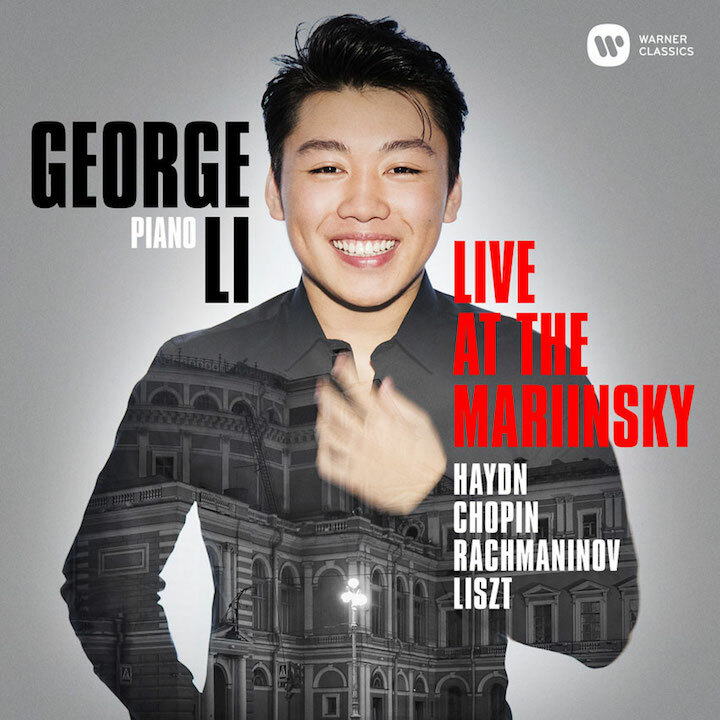 During the week there will be piano trios by Dmitri Shostakovich and Antonin Dvorak and performed by the exceptional San Francisco Trio; more tangos by Piazzolla; and works for one piano-four hands by Darius Milhaud and William Hirtz with Sykes and frequent guest pianist Randall Hodgkinson, who teaches at the New England Conservatory of Music. The Ear intends not to miss any of the four programs in the two coming weekends. And neither should you. They mean more immersion, even if it is not quite as total.